The Long-tailed duck is a true arctic species that breeds in the tundra and taiga regions of the world. Once know by the former name of “Oldsquaw” this long-tailed sea duck is quite the talker, emitting an almost constant chatter. A stunning duck, he is the only duck that undergoes two complete molts plus an eclipse and is the only duck to wear his breeding plumage in winter. Description: The Long-tailed duck is a medium-sized, heavy-bodied sea duck with a small bill, round body and short, pointed, dark wings. Males have a long-pointed tail and females have a relatively short pointed tail. Both sexes have white underparts. In winter the male has a dark cheek patch on a white head and neck, a brown breast and a pink band on a dark grey bill. The wintering female Long-tailed duck is similar but has a dark crown and brown back and lacks the pink band on the bill. In flight both sexes show dark wings and much white. Long-tailed ducks fly in clumped, irregular, small flocks. Individuals have an erratic, rocking, side-to-side rapid movement. Voice: Talkative vocal duck. Male has a melodious yodeling call - ‘ow-owdle-ow’. It that can be heard at great distances. Females make a soft grunting quack. Northern Pintail – has the long tail but lacks white face patch and pied pattern. Male pintail has green secondary feathers. Harlequin Duck – female has brown flanks and small round spot on the head. 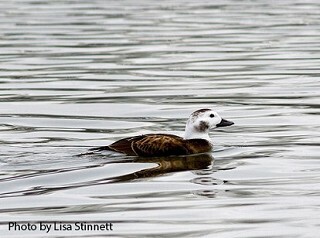 Habitat: In Tennessee, Long-tailed ducks can occasionally be found on deep freshwater lakes. 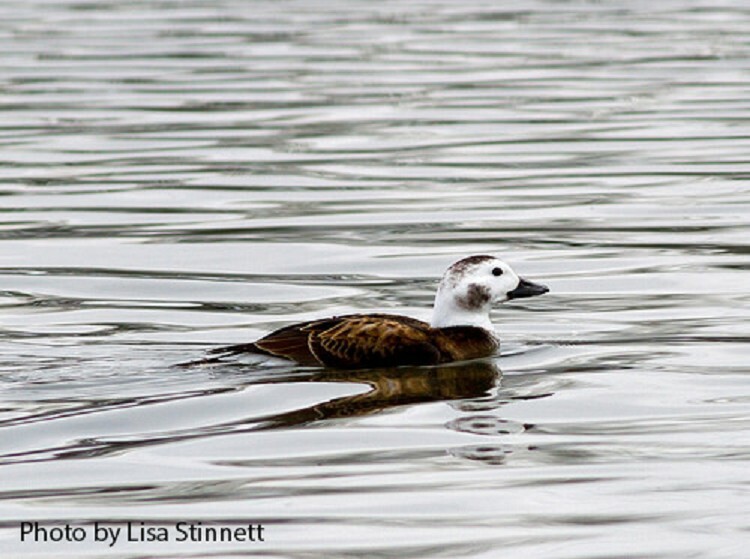 Status in Tennessee: The Long-tailed duck is an uncommon migrant in early spring and late fall, occasionally found in winter in Tennessee. Long-tailed ducks can dive to impressive depths of 195 feet. Long-tailed ducks are the only duck that goes through 2 complete molts plus an eclipse plumage. Unlike other ducks the Long-tailed duck wears its breeding plumage in winter. Robertson, Gregory J. and Jean-Pierre L. Savard. 2002. Long-tailed Duck (Clangula hyemalis), The Birds of North America Online (A. Poole, Ed.). Ithaca: Cornell Lab of Ornithology; Retrieved from the Birds of North America Online.